And below is how they look after two coats of paint- Sherwin Williams Brown Fox in semi-gloss for extra shine. 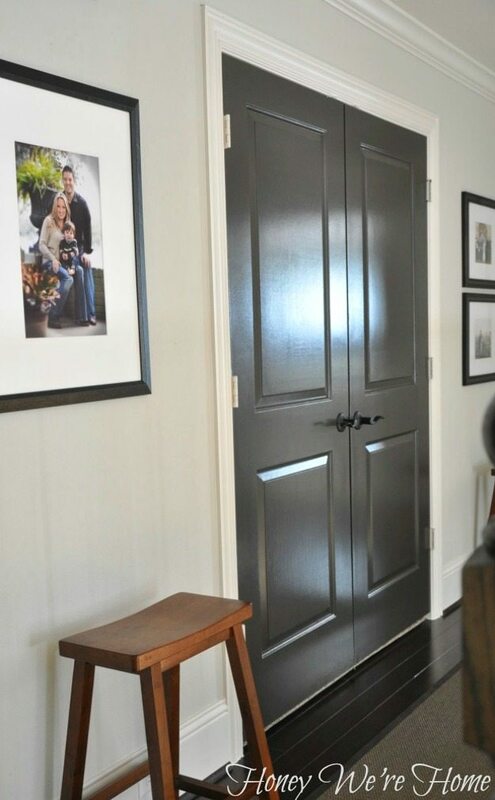 The paint color is a warm dark gray with a hint of brown in it. 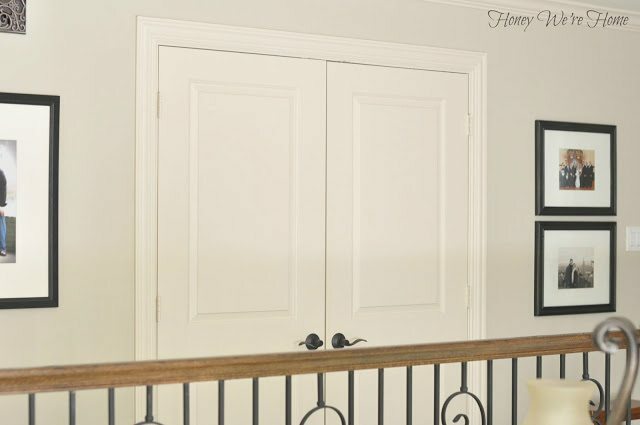 I painted these doors off the hinges, but in retrospect, I don’t think that’s completely necessary as long as you keep the door propped open or tape and cover the moldings/wall above the door. I used a 1.5 inch angled brush for the door moldings and a large roller for the rest. I also added about 8 oz. of Floetrol to the gallon of paint to help reduce roller and brush marks and I think it worked really well. I removed the hardware and taped off the hinges before getting started with the paintbrush. My little helper rolled some too. This paint looks really muddy brown after the first coat, but after the second coat, it’s a nice deep grey. I only painted the front of the doors, but ended up going back and painting the inside edge of the media room doors because you could still see the white when the doors were shut. The picture above shows the doors before I painted that inner edge. I’m really liking the contrast, but now I need to do the hall linen closet double doors on the wall opposite that mirror! What do you think of the change? Is this something you would do in your home? If so, what color would you use? I can see my son doing the same, he would definitely love to help me out 🙂 I loved reading 20 questions about you on Hi Sugarplum. I loved your idea about pre-mixing the breakfast oats and just scooping out. It can make life so much easier in the morning. That looks awesome! Such an easy way to punch up the hall! Is that a vent cover on your wall above your family pic? If so, where did you get that? I think that's our doorbell speaker cover because we have one downstairs too. Wow, they look incredible! The hallway looks so much warmer. Let the convincing process begin with my husband! 🙂 These photos clearly show what I have been trying to explain though. Thanks! Thank you! Yes, they need photos for convincing sometimes. the doors look fabulous. if we didn't have honey oak doors, i'd go this route! Why you didn't like the white colour? Very beutiful home! I actually did like the white, but wanted to punch things up a bit. I'm thinking new rugs too. I love it! Our doors have a bit of texture, so I don't think it would look great on ours. But I LOVE it on yours! Great idea! I love the change! Adds such drama. I tried Floetrol recently with great results too! When we moved into our house, all the doors were painted green. Yuck! I painted them all white, all 20 or so of them. 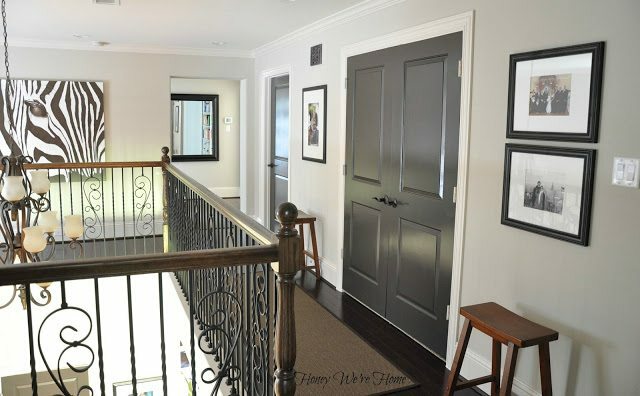 Then I painted the front door gray and thought well now I want them rest of the doors gray too. It looks so good. Unfortunately, I do not have the motivation to go through the entire painting process again. 20 doors!! Big job! I don't think I'd want to redo all that work either. Love the change. It looks so chic. I want to do this but so afraid I won't like it in my space. We have that too and I'm considering the same thing. Its crazy how colors look differently in other people's houses. 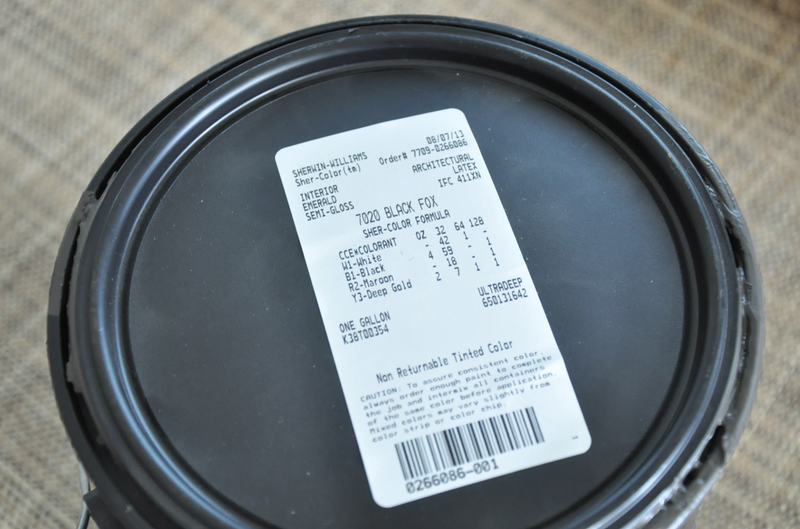 We tried black fox in our old house and it was BROWN, no gray at all! We went with gauntlet gray instead. Love it, looks great! I was really freaking out when I first applied it on the downstairs door and the first coat looked so brown. But the second coat looked way more grey. Choosing paint colors can be really difficult. Glad you found the perfect color for your home. These look great, you have such a beautiful home! I do think it works well! These looks awesome and that color is fab!! I've been wanting to do this in our new house. I'd never heard of that Floetrol but will definitely be trying it! I loved the pics on instagram, I love it more today. I have been wanting to paint mine for a long time now…this may have me convinced. 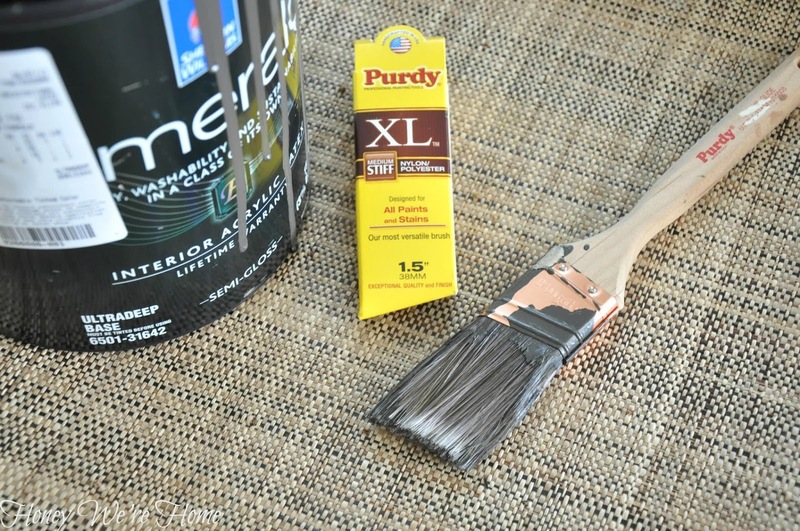 i saw this on emily clark's blog and she used urbane bronz and we did too. looks amazing. i suggest doing both front and back of doors thought. we didn't do that at first. This is one of those posts that when I saw the After photos, I literally said, "TA DA" This looks gorgeous. Thanks for the inspiration. PINNING! 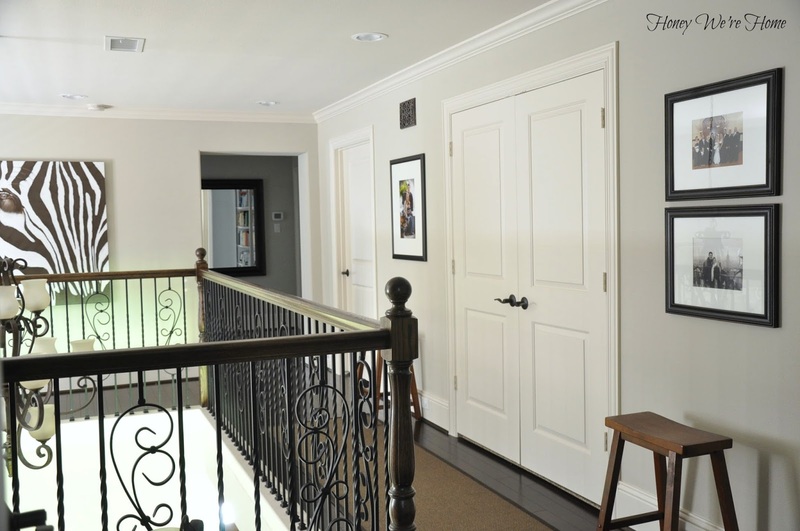 I've been wanting to do the same thing in our upstairs hallway too! You've just motivated me. It looks beautiful!!! You motivated me to update our master bath colors Susan! I love the darker doors. I have been hesitating doing some of ours because we have dark hardware. But, after seeing yours I'm convinced it will still work. Wow! 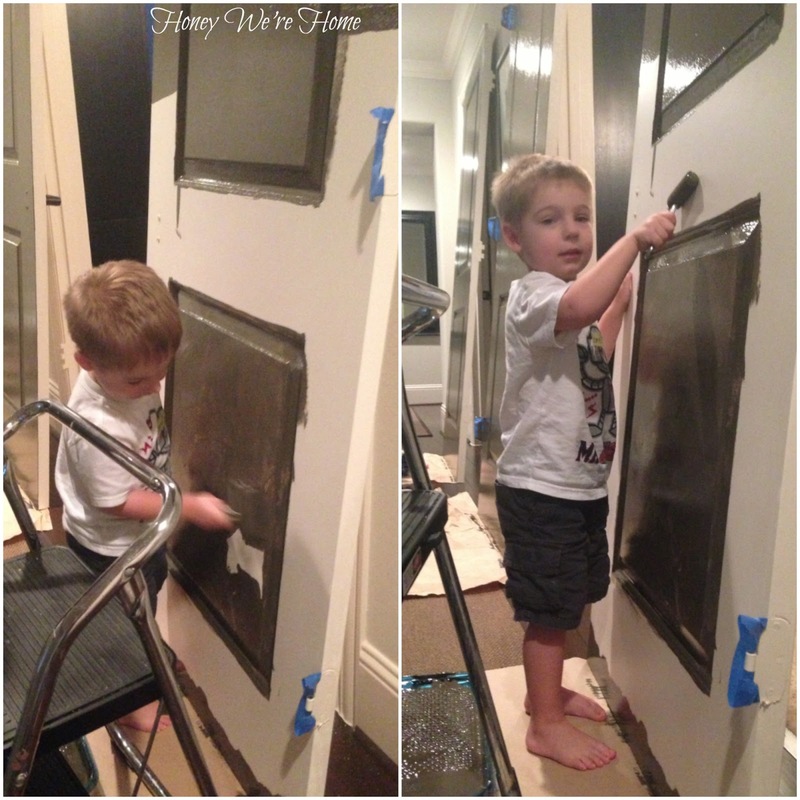 I opened your blog to look for the color you painted your powder room door as we are getting ready to do the same in our house!! And there it is a new post with all the info I needed. Love the look! Glad to help- I'd love to see how yours turn out! Have you ever shown us a peek inside your media room? Maybe I missed it! Would love to see. Someone else asked me the same thing! I shouldn't call it a media room, although that's what it was intended for! It's been mainly a storage/dumping ground but after a recent big clean-out, it's more of a playroom! It's pretty much a hot mess in there with a bad wall color- I was going for navy blue and it came out crayola blue. I posted it awhile ago but not sure when. I noticed it really brings the gray tone out of your walls too. I love your house, the layout looks so neat! HUGE difference – seriously looks so much more expensive. Love the tip about the paint conditioner too. I'm about to test it out on a smaller scale project I'm working on since brush strokes drive me nuts. I was okay with the white, but wanted more personality and think this works. 🙂 I'd love to hear your feedback on the paint conditioner. FLIPPIN' AWESOME!! I love how they're not as high contrast as glossy black interior doors. Such a perfect shade of grey! Also, I never knew about the Floetrel stuff–genius. PS. James is awesome, too. Can I borrow him, got some painting to do. James loves to paint- I'm sure he'd be all over that! He and Q can make it a date! Meg, it looks beautiful. Such a dramatic and beautiful change. So impressed with how much you have been tackling. I was going to do ours black, but now that I have seen this, I'm thinking gray! they look amazing! I love them! I'd never heard about Floetrol but it looks amazing! I really like the color you chose. James is just adorable! I bet he loves helping mama on projects. I always promise to let him help paint on projects- I think it's too irresistible for a 3 year old not to get to paint! I really like the way this turned out especially since it's not the typical black doors that I have been seeing. Wowza! I love it. 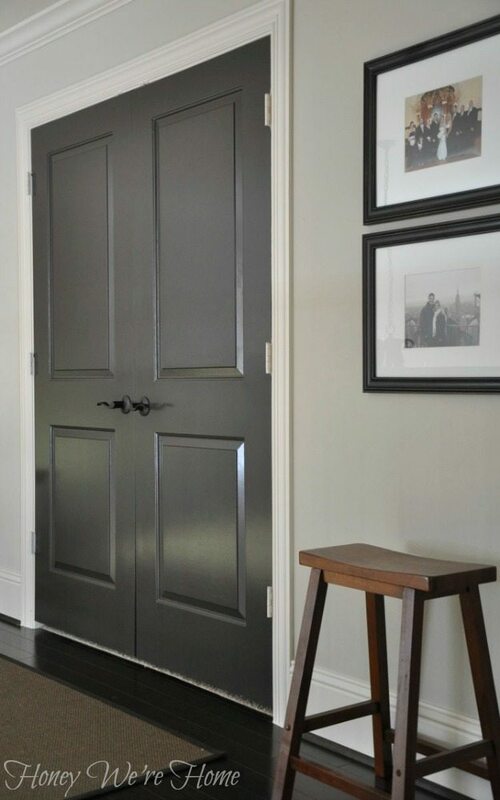 That is a fantastic grey colour, I love how it looks with your dark floors. Ooo and it's shiny!! Love, love, love. Gorgeous! Love the way this looks! And how cute is your helper?! Wow, what a dramatic change for a small amount of effort! It really looks classy. Good job girl! Ooh, thanks for sharing your paint color!! Totally love the doors! Wow! The hallway looked good before, but the impact of the new color is huge & I like it so much more (even though I wouldn't have guessed). Thanks Sarah! I do think it gives the hallway more personality. You have been knocking it out! Love the dramatic change! Love! The doors look fab and I would definitely paint mine but the hubby flat out said no. Ha but if I had my way I would paint mine black or stain them mahogany. Sometimes it's hard to agree on decor choices! It's 10 PM here and I'm wishing I could hop in the car to get some paint so I could do this at my house! It looks great! I totally know that feeling Tiffany! I get most of my best cleaning and organizing done late at night! I painted all the doors in my house basically that exact same color about 6 months ago and I LOVE it! Cool! That's a lot of work!! I still have two more to go upstairs! What a transformation!! It looks beautiful!! I love it!! Thank you Crystal! I always appreciate your kind comments! They look amazing! I love the color. Oh wow! What a difference it makes! I absolutely love it!! Wow, just wow…it is like night and day. A little can of paint is sometimes all it takes to make a huge impact. Great idea! Love the doors with the new colour. What a difference! Good job. Love your blog. Evelyne. Oh i love that color so much! And you did such a beautiful job along with your helper. That color is amazing. Wow love the contrast of the gray…it looks fantastic! Those look amazing! Really changes the whole look of the area. Very unique idea. Oh yes baby! Those look fabulous!!! Those doors look amazing! I'm in love with grey right now and getting ready to paint soon. What color do you have on the walls? 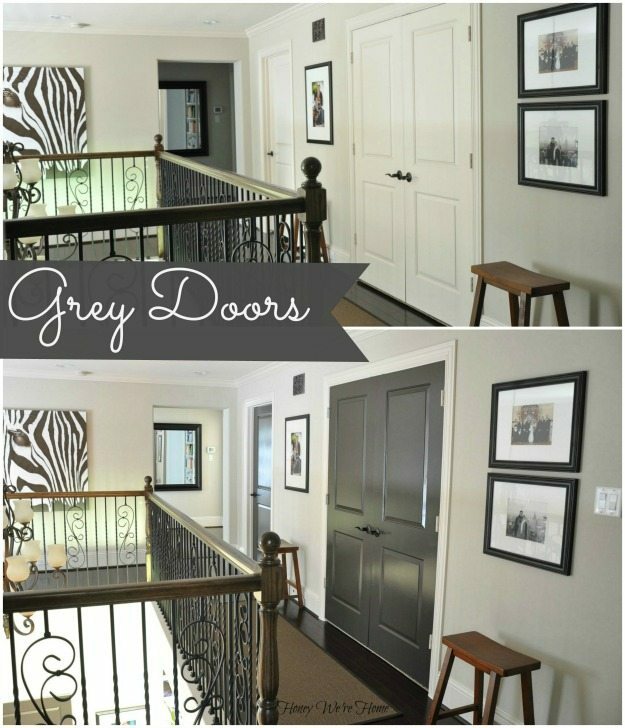 I am in love with grey right now and those doors are awesome. What color do you have on the walls? You can ignore my previous question about the wall color – think I found it on your blog… Agreeable Gray. Hi Megan! Can I ask what color your trim is? Ours was done in "shell white" by the builder and as we are starting to paint our walls (a greige color) we were told we should paint all the trim/doors "construction white." Because we are overwhelmed with crown molding, trim, and doors, shutters, and built-ins the cost is really (really) high! I'm just wondering if it's really worth it. Your trim is great, so I'm wondering what the color is before I make my decision about changing mine. You did an AMAZING job on these. Looking at the last pics alone, I would have thought for sure they were done professionally. I so, SO want to do this and you have completely inspired me. Even my husband (who I am always showing pics of things I want to do and his usual response is something along the lines of 'yeah, babe, that's great) loved them and was up for doing this. Don't think he would have gone for it, if he hadn't seen your before and after! 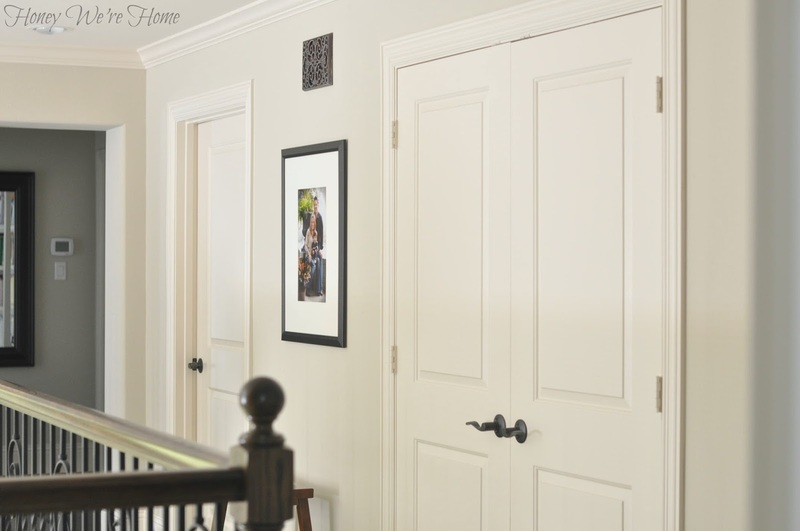 Your doors look fantastic and go great with your wall color! I was wondering if you would tell me what color paint you used on your walls? Thank you! Just beautiful! What a difference color makes! 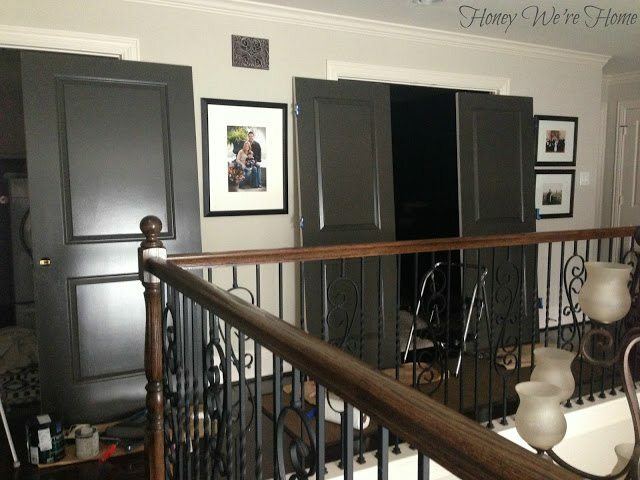 We had painted doors in out last house and really loved them….this was back in 2007 and the builder thought we were crazy! But all our nieghbors said they wished they had thought of it. Love the doors, good job! Do you happen to know the color of the trim and walls? I fell in love with Black Fox for my doors but I need to find a wall/trim color that will be light enough to balance the dark doors. My floors are also very dark. Any help would be great! Thanks. Do you happen to know the name of the paint used on the walls and/or trim. 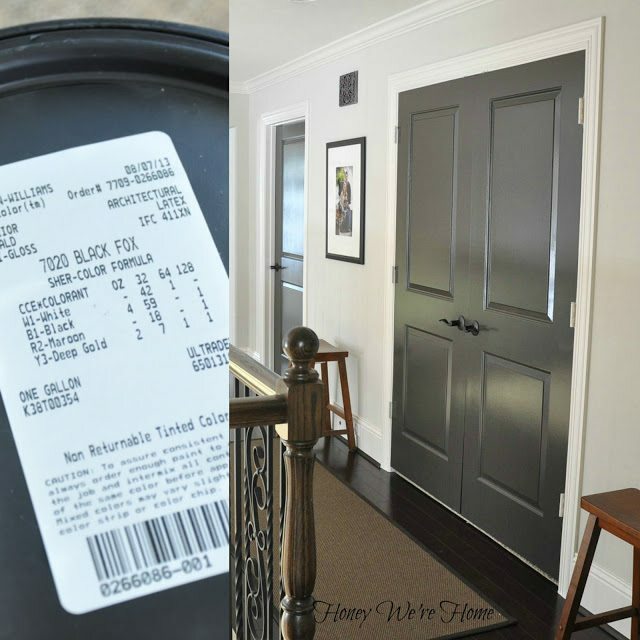 We are painting our interior doors with black fox and are trying to paint the walls/trim a light color because my floors are also dark. Any help would be appreciated. Are those doors from Calgary? I love the grey! I really think it ties the whole thing together! I can't wait to have my own house to decorate. I'm so excited. Gosh Jason, I have no idea! Sorry! I just had my hallway doors and kitchen to garage door painted this same color (thank you for the inspiration). I was a bit nervous they would be too dark as we have a narrow hallway with lots of doors! They look BEAUTIFUL!! And it warms the hallway up sooo much! My husband even loves them 🙂 Thank you so much! So great Ginny! I still need to finish the rest of the doors in this hallway! I've been wanting to do this for so long and am now ready. But I am worried it will go out of style since I waited so long. What do you think? Do you still love it? Has it held up? I was told to use a deglosser on my doors so the paint would withstand everyday wear. Did you just paint upstairs or ALL the doors in your house? We are remodeling our house and I want to paint the doors and windows a dark color. The professional painters are giving us outrageous bids. You have made it look so easy. I'm very crafty and hands on but have never painted before and I'm afraid of brush or roller marks. I like your suggestion about using Floetrol. Did that completely eliminate the striks or did u end up with some? In the picture the doors look very smooth. My husband wants that factory finish look. Do you think you were able to achieve that? Thank you! The floetrol helps a ton, but there are still some brush marks. I would say try one door on your own that's in a less obvious place and use that to get the hang of it and then try the other doors. Or if your first try is terrible, you know you can call in the pros. Hi, love your door color! What color do you have on your walls? I see this is an older post and wondered if you still love it? It’s so different I as afraid I will get tired of it. Has it held good? I went to go get the paint and the door and trim paint that it sturdy doesn’t come with the base dark enough to tint , so that must be why you got the Emerald brand from Sherwin Williams.